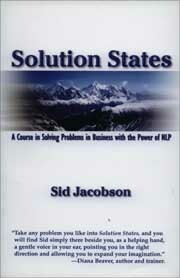 This is the first book to comprehensively apply NLP techniques to problem solving. It is set up as a self-development course using basic NLP principles to help anyone who needs to solve the problems that keep them from achieving their goals. Part I allows the reader to understand clearly the problem space, i.e. what makes a problem a problem. Part II provides a guide to developing a Solution State to create workable, effective and ecological solutions.